Isn't this salad pretty? I love how pretty it is! 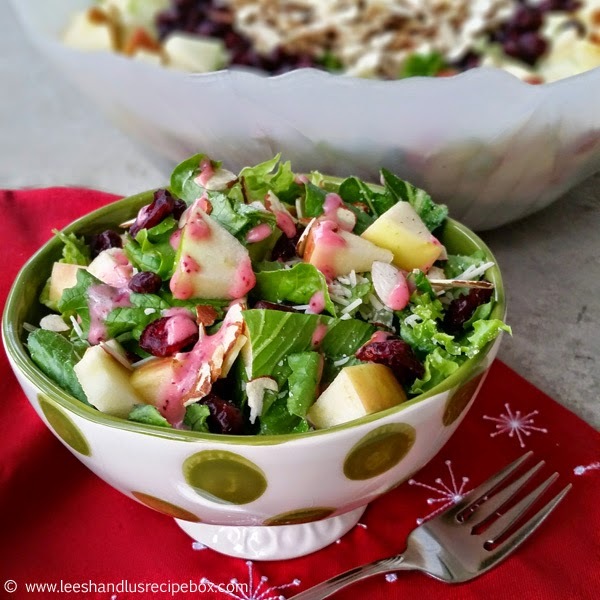 This is one of my favorite salads and it's perfect for the Holidays. My mom has been making this salad for several years now. If I remember right she first made it to take the their annual Christmas party that they do with their college friends. I love that they still keep in touch! I think it's so awesome. But since this salad made it's first debut in the family, it's been coming back again and again. 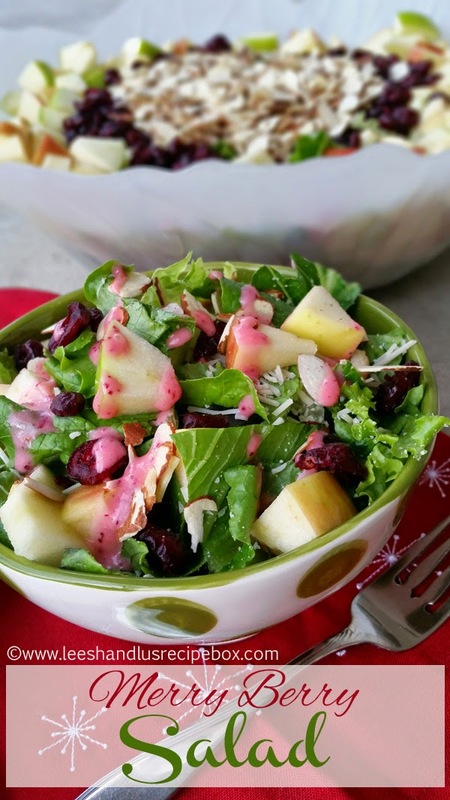 It really could be made year round, but it seems seasonal with the dressing that is loaded with fresh cranberries. Isn't the color wonderful? It's not only beautiful, but super delicious. It comes together rather fast. You can buy a pre-bagged salad mix or wash and prepare your own. We enjoy it with Romain and red/green lettuce. The apples (or strawberries or blueberries) really add some pretty color to the salad, and so do the dried cranberries. I'm a fool for fruity salads! The dressing is easy to whip up. It calls for fresh cranberries and some thawed apple juice concentrate. We've found that buying it in the handy Langer's brand bottles makes it easy to use a small amount at a time and save (it comes in a clear plastic bottle with screw on lid). I hope you will enjoy this salad this holiday season! In a small skillet heat over medium heat and add almonds. Toast by stirring them constantly until slightly browned, 3-5 minutes. Set aside to cool before placing on the salad. Wash and spin salad and place in a large serving bowl. Top with grated parmesan cheese, as much as desired (½ - ¾ cup about). Next you’ll arrange the other salad toppings in rings around the bowl. 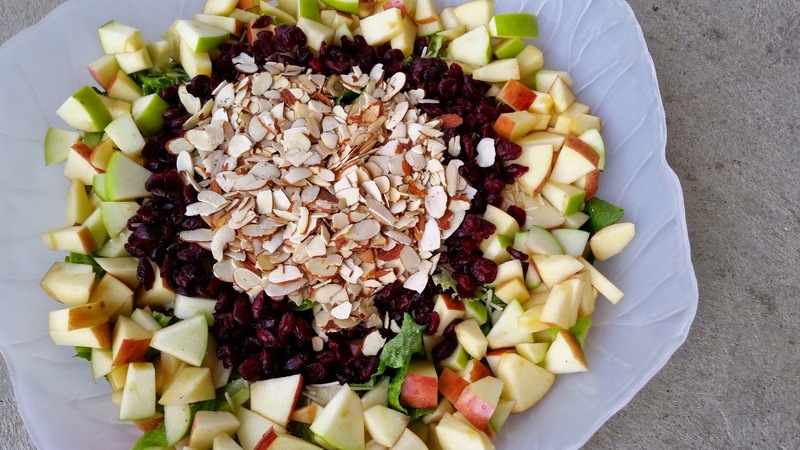 Chop apples (toss in a small amount of lemon juice if you won’t be serving soon, to prevent browning) and arrange in a ring around the outside or the bowl (see picture in post), then arrange the cranberries around the bowl just inside the apples. Next place the almonds in the center. Wrap with saran wrap and place in the fridge if not ready to eat right away. With an immersion blender or regular stand blender. Add all the dressing ingredients except the oil and blend til smooth, slowly add the canola oil in a small drizzle to the mixture and blend til smooth and creamy looking. Refrigerate until ready to serve. Toss salad with dressing before serving. I would love this salad very much! Great flavors going on!